At its core, running is about repetitive movement provided you put one foot in front of the other repeatedly and generally propel yourself in a forward motion, you run. However, it can be a bit misleading to think that putting “one foot in front of the other” is where running begins and ends. How you take those steps, and more importantly, how many steps you take, can dictate a lot about your success as a runner from your speed all the way up to your propensity for injury. In running parlance, a runner’s cadence refers to the number of steps or strides the runner takes over a given period of time usually measured in steps or strides per minute. Understanding the importance of your cadence can help pave the way for you to be able to put in mile after mile, year after year, for the long haul. When you begin researching more about cadence, you’ll likely find the number 180. This value refers to the number of steps per minute most runners should aim to take, and this belief is so strongly held in the running community that it’s something that has become passed down, from generation to generation, without question. The idea here is that as long as runners take 180 steps per minute (spm), they will be far less likely to overstride, and by not over-striding, runners will reduce their injury likelihood (particularly for shin splints) and will be able to run injury-free. The magic 180 value dates back to the 1984 Olympics and a study that iconic running coach Jack Daniels conducted. In his study, Daniels noticed that of his small sample size (46), only one elite runner had a cadence with a value of lower than 180 spm. Since this original study, Daniels’ research has been misinterpreted and misquoted, propelling the belief that 180 should be the magic number for all runners. While there isn’t necessarily a hard-and-fast magic number that all runners should strive to hit in their cadences, more likely than not, most runners could benefit from upping their cadence. More recent research, post-Daniels, shows that cadences that are 160 spm or lower typically indicate that the runners are over-striding and thus, are increasing their propensity for common runner maladies like shin splints. Many of us probably don’t think much about how many steps we take when we run, but once you become cognizant of your cadence, you can make some improvements to get your value higher and have a higher turnover. Determine your starting value before you make any changes to your stride. Go for a run and count how many times one foot hits the pavement in 30 seconds. After you find that value, double it (to find the number of times your foot hits the ground in 60 seconds). Once you have this new value, double it again to account for how many times both feet hit the pavement in 60 seconds. Finding your base value is critical because you can’t change anything if you don’t know where you stand in the first place. Assess and reassess regularly. There are many tools available that can help track your cadence so you don’t have to rely on “manually” counting your steps on the run. A metronome or a GPS-enabled watch that comes with an accelerometer will measure your cadence on each run, and you’ll also get the bonus of other data points when you use these pieces of technology on your runs. Having the data available to you also will show you trends over time about your cadence on your runs – how it varies on runs of varying speeds (general aerobic, tempos, speedwork and the like) and on runs of varying terrains (roads versus trails) – and you’ll be able to identify trends over time and whether you are progressing. Music can help and some individuals find that listening to music or even podcasts can help them increase their cadence. You may find that you subconsciously move your feet to the beat and rhythm of the music, which can result in a higher-than-usual turnover and cadence. A quick online search will yield several websites that feature songs indexed by their beats per minute to correspond with your desired steps per minute. Some sites still regard 180 as the gold standard but do your research. Listen to an expert – your coach. Coaches have the technical knowledge and experience to be able to guide you on ways to increase your specific cadence, which will likely differ from that of another runner. Our cadence can be determined by many of our physical characteristics such as our height, stride length and speed, and working one-on-one with a coach will be helpful because as you’ll surely learn, you are effectively an experiment of one. Knowing your particular circumstances, a coach also can give you targeted workouts to help you increase your cadence and become more cognizant of it. Think of progress as a long-term goal. Finally, remember that increasing your cadence can be a long process. Consider increasing your cadence slowly, by only 5% initially. When you are actively trying to increase your cadence, you may find that your running “feels” different, too. Trust the process just like with anything else related to running. How many steps we take in each minute of running can dictate our ability to continue to run injury-free, so while running is a fairly straightforward activity – one step in front of the other, over and over again – it’ll behoove us as runners to learn more about, and monitor, our cadence over time. About The Author: Dan Chabert, writing from Copenhagen, Denmark, is an entrepreneur, husband and ultramarathon distance runner. He spends most of his time on runnerclick.com and he has been featured on runner blogs all over the world. Recently, I was honored to have received the SCW MANIA® Presenter award! My humble beginnings in this industry were in Kung Fu (Chinese martial arts). Trust me, there is no more stringent movement critic than a Sifu (martial arts instructor) other than a Russian Ballet master. Every nuance of movement mechanics is CRITICAL since the difference between deflecting a strike and being hit hangs in the balance and one inch matters. Couple that with immersion in strength and conditioning (I got my first ACE PT certification in my early 20s, followed by AFAA GFI and many other specialties to follow over the years), and a conscious movement professional emerges. It’s a love affair that I’ll never give up whether it be Kettlebells, boxing, conditioning, massive lifestyle changes – it’s all amazing every day. Most important is to affect those on the front lines, which is why I mentor fitness professionals and the driving force behind creating Speedball Fitness: – to affect as many apparently healthy bodies as I can in a positive way! 1) Accountability is important and visibility of overall accomplishment feeds the results-driven crowd. This means that our efforts are quantifiable and this is positive for those methods of delivery that are science-based. 2) The industry is catching-up to the original research on HIIT and waking up to the fact that “hard for the sake of hard” is causing more damage than good. Emergency room visits are up 300% in the last decade due to fitness injuries and this is in direct relation to the trends that have hijacked the general population largely due to marketing and misapplication of proper research components. For example, Tabata filtering into multiple days a week of training without proper mitigation of stress on participant and impropriety on part of the delivery agents that don’t include a well-rounded plan on exercise longevity, etc. This has proven to confuse the public. We are attempting to rectify this as an industry (2016 predictions for ACE trends in exercise, Pete McCall – SCW Presenter). What we’ve seen published is a return to LSIS/LSD with spikes of intensity (Fartlek), which is both inclusive and injury-preventative for both personal training and group fitness. Methodologies that allow for a wide variety to improve quality of movement and sustained activity (Speedball Fitness, etc.) will be the return to the past and future of long-term fitness for all apparently healthy bodies that are medically cleared for general exercise and allow for both movement improvement and provide the atmosphere of success without breaking down the body. Our goal should be to provide the atmosphere of success for ALL who come to us for guidance and representing SCW in this capacity to fitness professionals equally fills me with pride and purpose. I’m proud to be a part of the future of fitness, which reflects the common sense of the past. Some things work because they work and will never change because science tells us that they will ALWAYS work! This award from SCW further validates this paradigm and makes me proud to be a part of this for over 20 years. Speedball is intense, NON-STOP multi-directional conditioning featuring the revolutionary SpeedBALL. The class is appropriate for all fitness levels! Experience the opportunity to learn from Steve LIVE at a MANIA® near you! Inject insulin in a part of the body that will not actively be used for exercise. The abdomen is recommended. Check blood glucose levels before, during and after exercise the first couple of exercise sessions and/or if trying a new activity. Lobb-Oyos M and Barkley S. (2012) Diabetes Medications: Guidelines for Exercise Safety. ACSM ’s Certified News, 22(3):6-7. In my behavioral change and coaching class at San Diego State University, we use role-playing scenarios frequently to evaluate and self-evaluate our communication strengths and weaknesses. Students take turns role-playing the initial dialogue between professional and client/patient with one observer who will videotape at times (for self-evaluation purposes), watch (with ears covered) and listen (with eyes closed) for congruency in the message and efficacy in communicating. They also explore ways to build rapport by initiating dialogue and connecting through various off-beat topics (e.g., talking about needlework, chia pets and anthills), and they evaluate listening-speaking ratios – aim for the 70-30 rule where you listen 70% of the time and try speak only 30% of the time. Four key skills to effective communication generally involve (in order) asking open-ended questions to learn about the person; active or immersed listening as opposed to passive or selective listening; understanding the true message being communicated to us via words and emotions; and lastly, responding after you have a full grasp of the situation. To quote Steven Covey, author of The 7 Habits of Highly Effective People, “Seek first to understand, then to be understood.” We need to first listen and understand people during the rapport and investigation stages before we decide to respond with any proposed solutions. Many of us experience difficulty in separating ‘understand’ from ‘respond,’ as we often listen with the intent to respond (i.e., passive listening). Keep in mind, however, that listening first sometimes guides you to ask the right questions. After all, it was Jonas Salk who discovered and developed the first Polio vaccine, who said “What people think of as the moment of discovery is really the discovery of the right question.” Sometimes listening first can lead us to the right questions. Listening is certainly an art form and our primary non-verbal communication skill as it captures both content and the emotions behind a speaker’s message. As humans have the capacity to listen and process up to 500 words per minute in comparison to speaking approximately 125 – 250 words a minute, we are better suited to listening and thus, should do it more effectively. 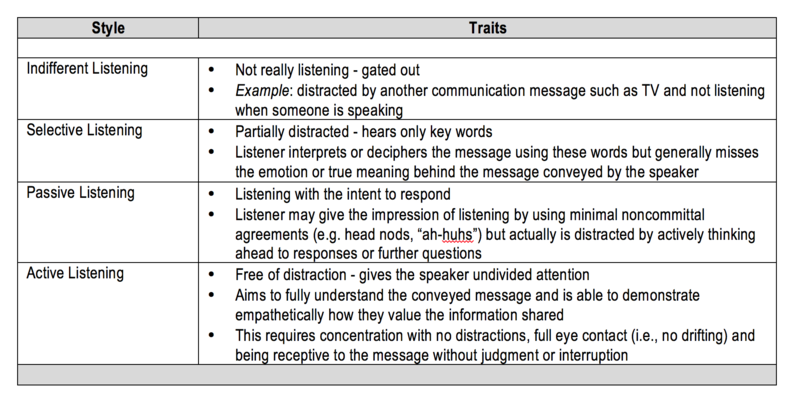 Various listening styles exist (Table 2), each with its own unique traits and characteristics, but only active or immersed listening is what we should strive to incorporate as professionals. Become more mindful – avoid being judgmental about the message as it is shared and don’t get tripped up on or distracted by any emotional hot buttons. Be attentive to all nonverbal cues and verbal tonality. Control your external distractions – physical distractions such as people and sounds that can be easily controlled with some careful planning (i.e. meeting clients in a quiet location). Filter out your own internal chatter – control any distracting thoughts or thinking ahead to your answers or next questions. Focus completely on the individual and avoid multi-tasking such as simultaneously writing while listening since you will miss much of the nonverbal message. Use transitional pauses to makes notes, reflect, paraphrase and think of your questions. Two key factors for successful and sustainable behavior change are building the importance for change and its relevance to one’s immediate life. During the investigation phase, ask one simple open-ended question that will help you understand the importance and relevance by how individuals connect their communication to their behaviors or actions. Ask how their life would be different if they could accomplish the changes they desire and ask them to take a moment to carefully think about their response. When talking with Joe, ask him, “Joe, given the challenges you have just shared with me, how would your life differ if you managed to make these changes?” Now listen to the manner in which he responds drawing from the information provided in Table 3. For example, if Joe mentions that by losing 50 lbs., he would be able to play with his grandkids and possibly reduce the amount of back discomfort he lives with, then he is connecting his communication to behaviors (playing with his grandkids) and sensations (reduced discomfort). Whenever you need to build importance, relevance or even find some additional motivation (when it appears to be waning), use those same traits he expressed (i.e., behaviors, sensations). Personality Indexing – a critical skill set needed to determine how to appropriately treat and communicate with people. For example, an individual scoring low on sociability doesn’t value much rapport initially, or at any point, in comparison to people that are highly sociable. Given this knowledge, a professional then can treat individuals accordingly as they want to be treated. Various indexes exist, including the Myers-Briggs Type Indicator (MBTI), DISC Profiling, Daves and Holland Model and the OCEAN personal dimensions. A low dominance and low sociability person, for example, is more inclined to respect you more if you provide them with facts and statistics that appeal to their need to be detail-orientated and correct. Furthermore, they will greatly appreciate consistent follow-ups and a person who is well-prepared, detail-oriented and organized. Even the way we communicate reflects our personality styles – the rate at which we speak and the frequency and conviction in vocal inflection provides insight into one’s personality. For example, a person speaking at high rates with higher inflections (i.e., animated, energetic and charismatic) is probably highly sociable and dominant and values being stimulated by incentives, challenges and rewards that are offered to them. Emotional Intelligence (EQ) – reflects one’s ability to recognize and understand emotions and how one uses their skill of this awareness to manage oneself and relationships with others. EQ is divided into two primary competences, personal competence and social competence, with each playing a critical role in how you sense and manage you own emotions in the moment while identifying the emotions of others and managing those interactions successfully. It is estimated that EQ reflects 58-60% of job performance, whereas the Intelligence Quotient (IQ) reflects just 10-25% of job performance. Approximately 90% of top performers in business possess high EQ scores while only 20% of low performers in business have high EQ scores illustrating just how important understanding EQ is to overall business success. In closing, the aim of this article is to highlight just a few of the critical communication skills needed by trainers and coaches to succeed and not simply survive as a professional. Although many of us often believe we communicate effectively with others, how often do we take the time to evaluate the true effect of our message upon the receiver (i.e., perception of the message) and the consequence of our dialogue? As mentioned previously, effective communication is an art, and as such, it requires a significant investment of time, effort and resources. Take the time to evaluate your communication Strengths and Weaknesses using any self-evaluation technique or feedback from others and identify Opportunities or areas in which to improve or showcase your communication skills but never allow yourself to become complacent (Threats) by thinking you are an effective communicator or the message you think you are communicating is aligned with what you think your clients perceive (i.e., conduct you own S.W.O.T. analysis). We often spend much of our continuing education money and time focused upon the exercise sciences yet largely ignore perhaps what is the most influential determinant to our overall success – communication. Consequently, it is time to rethink the way we train and retrain the way we think. Learn even more from Fabio LIVE! SCW OnDemand is a brand new premium video subscription service that puts instant access to hundreds of unique workouts right at your fingertips, on your computer or mobile device. Enjoy UNLIMITED STREAMING of your favorite presenters demonstrating the best of Group Exercise, Aquatic Fitness, Yoga, Barre, Pilates, Kettlebells, Active Aging, Dance, Sculpting, Personal Training and much more! We take the most exciting sessions from MANIA® and add them to our growing number of videos to keep you stocked with inspiration all year round!